A Wagah border like-structure will be constructed in the border areas of Sonahat in Dhubri district to promote border tourism in Assam. The massive project to be undertaken by the Border Protection and Development Department (BPDD) will also strengthen the relationship between India and Bangladesh. District administration officials said the department has already allotted Rs 5 crore for the project, reports The Assam Tribune. 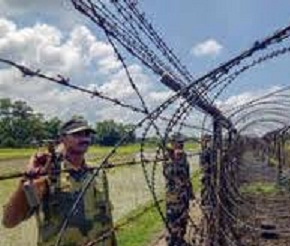 As in the Wagah border, a flag-lowering ceremony will be conducted by Border Security Force (BSF) personnel in this international border. The flag-lowering ceremony performed at the Wagah border is a joyous and popular function which attracts a large number of people daily to the border. Apart from the flag-lowering ceremony, there will also be performances by the Army troops and various cultural groups. The BSF officials said that the cultural groups will showcase the rich culture of the northeastern region of India through music and dance. Security forces will also showcase the strength and power of India, an official said. Construction of an auditorium, museum and restaurants at the border are also being planned. Dhubri ADC Pallav Mazumder said that Sonahat has been chosen as a site for carrying out the project because it has an International Trade Centre and the roadways of the town are better than other border areas of Dhubri district.